I sewed another paper pieced block this week- the Lone Starburst. Much as I love the finished block, I must admit that it drove me a little bit crazy! The worst part was when I discovered a small area that was not covered by fabric after I had taken all the paper off- AAARGH! That said, I think I managed to fix it pretty well and even I am not sure which point of the star it was! This beautiful block actually arrived about a week ago, but my overly zealous husband thought that it was a birthday present so he squirrelled it away with my birthday mail. Poor Leonie was getting very worried about the missing block, so it was good to be able to put her mind at rest and have a good giggle about it with her when I finally opened it on Monday. Isn't it great! I really do love how this quilt is coming together! Love the Lone Starburst. I think it's possibly my favourite one yet! (I think I say that each new block though!). I am not usually a grey person but it just sets the colours off so beautifully. wow wow wow! I really love that block- it is just GORGEOUS!! I thought last weeks was my favorite, but this one- well it can be a tie can't it? Stellar work Juliet! Love all the blue, orange and grey! Your starburst block is awesome! Fantastic block. The colors are awesome. What a fabulous work. It may have been a bugger to sew but it looks fantastic! Wow! You are going to have a gorgeous quilt when you are finished! omigosh that lone star burst is gorgeous!!! That is going to be some quilt when you are done, amazing! Juliet, all your blocks are beautiful! I am amazed at the craftmanship! I seriously need to get over my fear of paper piecing. I love it all, I used the star for my bee to make me patriotic blocks. Love it. Love your colors, love your fabric. Great job. 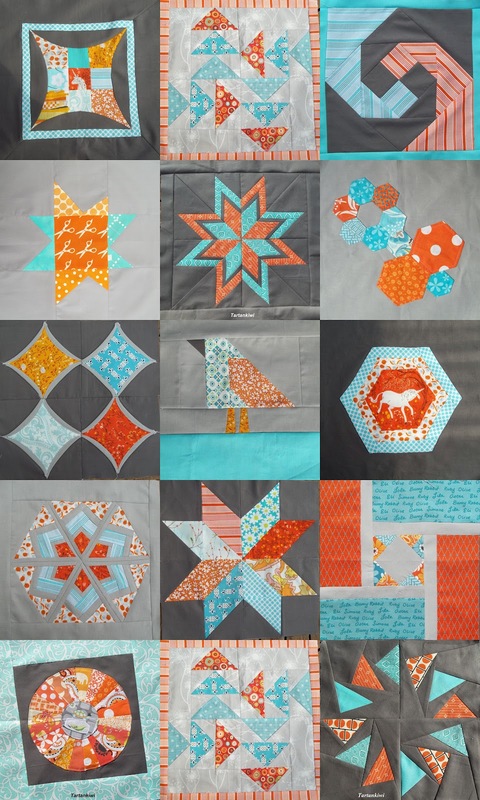 I love all of your blocks- the orange and aqua look lovely with the grey! wow they are gorgeous! Love your latest & love the wonky circle you got in the mail not for your birthday! Just beautiful! I love the lone starburst! It's so beautiful and the points are so crisp and neat. That is going to be one incredible quilt judging by the collage. Amazing star and well worth the work. The blocks look awesome together! Wow! I LOVE all of your blocks :-) Your blog is so cute, too! Count me in as your newest follower.